Matching folio to their blockbuster CCM cross-over debut release featuring: Art in Me * Flood * He Boy on a String * Like a Child * Liquid * Love Song for a Savior * Sinking * Worlds Apart and Blind. Jars of Clay is a Grammy Award winning Christian rock band from Franklin, Tennessee. They met at Greenville College in Greenville, Illinois. 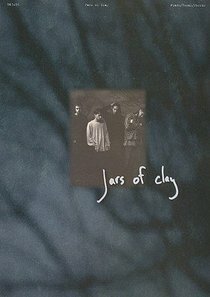 Jars of Clay consists of Dan Haseltine on vocals, Charlie Lowell on piano and keyboards, Stephen Mason on lead guitars and Matthew Odmark on rhythm guitars. Although the band has no permanent drummer or bassist, Jeremy Lutito and Gabe Ruschival of Disappointed By Candy fill these roles for live concerts. Past tour band members include Aaron Sands, Scott Savage, and Joe Porter. Jars of Clay's style is a blend of alternative rock, folk, acoustic, and R and B. The band's name is derived from the New International Version's translation of 2 Corinthians 4:7: But we have this treasure in jars of clay to show that this all-surpassing power is from God and not from us. This verse is paraphrased in their song "Four Seven," which appears on Frail and as a hidden track on the CD release of their self-titled album. Customer Reviews For "Jars of Clay"